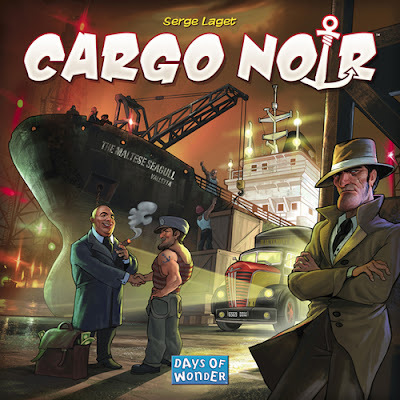 Cargo Noir is a typical Days of Wonder production where game play is straight forward and the components are top notch. Since it is a game about smuggling goods the goal is to collect valuable sets of contraband; gold, ivory, uranium, weapons, etc. and trade them for things any crime boss might be interested in owning, like a villa, yacht, or dive bar. These villa, yachts, dive bars, etc. are victory spoils cards and are worth victory points. Additionally, there are three types of smuggler’s edge cards that aid players in collecting money, adding warehouse space, or adding ships to their fleets as well as yielding a few victory points. The main board is set up so it can be adjusted to handle from 2 to 5 players by turning over certain double sided sections. During their turn players will send ships with a number of coins to bid on the contraband available in various ports. If the bid is successful, the contraband will be stored in your warehouse until you have sufficient sets to trade for smuggler’s edge cards or victory spoils cards. There are places to send your ships to exchange goods at a black market or to visit a casino for a quick infusion of coins. The key to success is managing your supply of coins and placing your ships in the most advantageous ports. The game takes place over 10 or 11 rounds depending on the number of players. The player who has acquired the most victory points will win. Cargo Noir is easy to learn, quick to play, and always competitive. We have an open copy of Cargo Noir available in our Demo Games Library for you come in and try out.